Alright! The mod is now moving smoothly once again! Furthermore, I am now working on placing the model ingame to start working on the remaining files to get the car working, and I should be ready to start beta testing the mod in a couple more weeks. 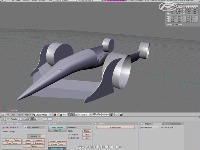 Well, the car is now nearing completion as far as the model is concerned. I now have completed the body, wheels and hubs, brake ducts (front and rear), suspension and rear axle, front and rear wings, rear diffuser, exhaust pipes, and the cockpit screen. All I need is to finish up modeling the cockpit interior and begin UV mapping (I hope I can figure it out!). And I still have no idea how to import the model into the game, please, I need help on this! Well, after much toying around and seeing so many other car mods that were either too difficult to haggle with or just weren't good enough for my tastes, I decided I want to make a car myself. 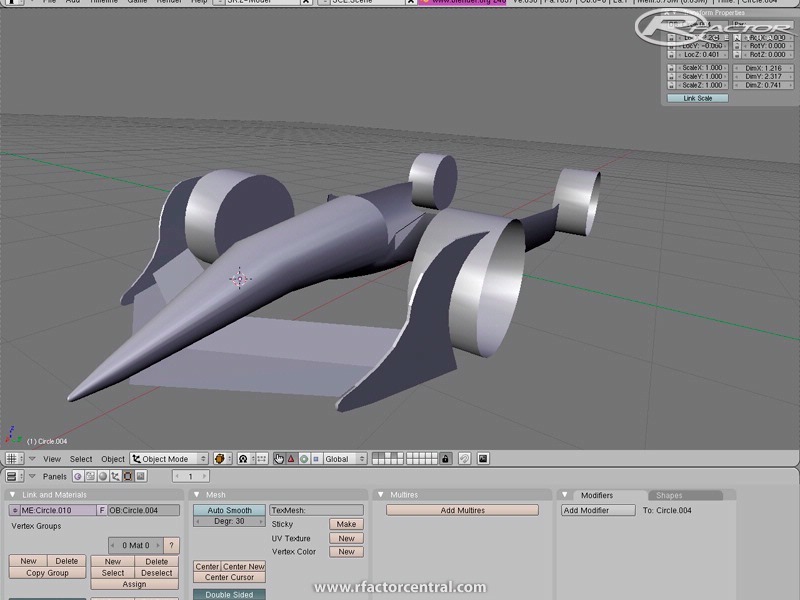 This scratch-built Formula car was inspired by several sources, the most of which by the "teardrop" shape (hence the name), and being the perfect aerodynamic shape, I wanted to build a high-performance car around it. Obviously, this car mod is not designed to be super-serious, but an experience in rFactor modding, and to make a futuristic Formula car designed for unprecedented acceleration, cornering, and top speed, and of course, to have fun with! 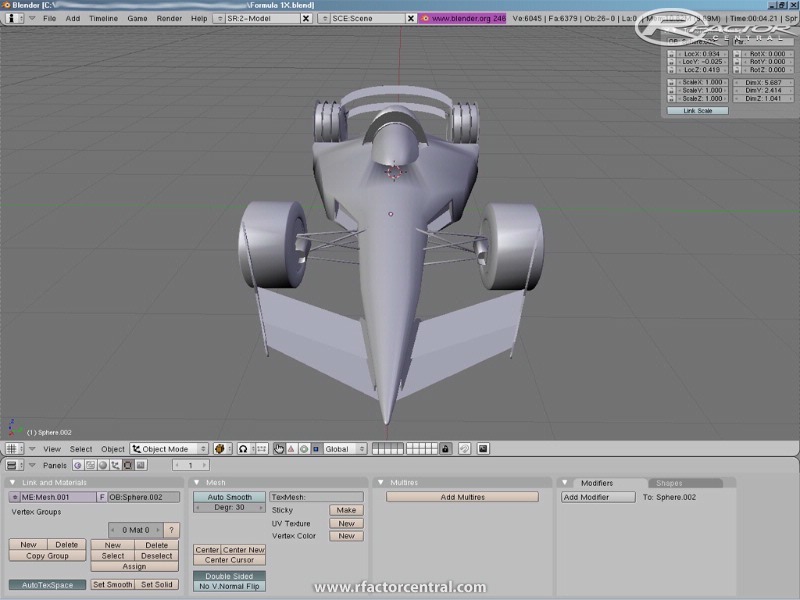 As for a time frame, I want to have this car completed and ready for in-game testing in 1-2 months, and complete testing and set for a public release a week or two after that. Stay tuned, more progress to come! The two incidents this past weekend (Massa and Surtees) got me thinking about this mod again. Looking forward to it, hope things are going well. Can't wait to start slinging this thing around, wouldn' this be cool to race with at night in Monaco? If you find how to do it , describe it in your topic, it will be greatfull for us! @ roadhog: F-Zero on wheels...hmm, yeah that sounds about right! Don't get me wrong, I love my Formula 1 recreations to death, *Ahem*CTDP*Ahem* but you can expect a much more intense experience with this beauty! Like I've said before: "If my heart's still beating, it's not intense enough!" 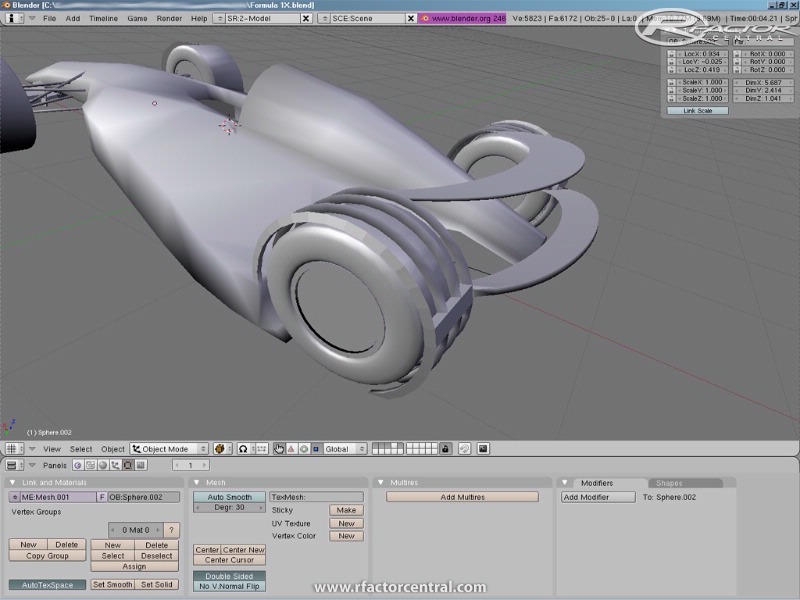 Of course, don't expect much about this car to be "realistic", but hey, what fun would that be if it was? @ cashewboy: I agree completly! And the Brabham BT52 is absolutely marvelous! I quite enjoy having that thing sitting in my rFactor garage. But anyways, now you guys have a glimpse at the underside I've kept hidden all this time (yeah, it's not much, but oh well. ), and I finally solved my dilemma with the rear end! I've extended the far back of the bodywork just a little, and if you compare the old shots with the three new ones, I've partially rebuilt the body, using a different technique than what I started with. 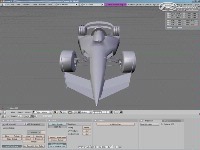 Also modeled now is the rear suspension, and the rear axle. I really want to get back to that rear wing now (oh, how it's been the bane of my existence since I started the model!) It'll probably go through another minor revision or two before I'm satisfied with it. 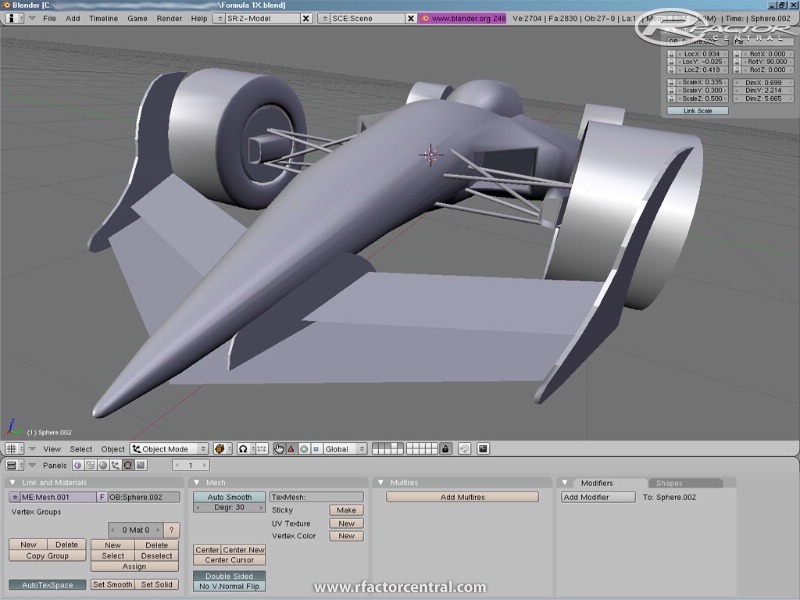 I've also started thinking about the physics lately, I'm thinking I'll go with the physics from ISI's BMW 2008 F1 car as a starting point, and start ratcheting up a few values and see where that takes me (obviously no physics experience whatsoever here, LOL). And about that cockpit, I've made a few more revisions in my head, just haven't got it into the model yet. 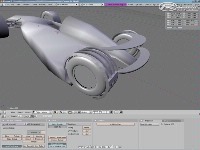 I'll get back to it when the rest of the car is modeled. If Formula 1 wasn't regulated, we probably would've seen something like this about 15 years ago. Those designers are genius. Oh wait, remember the Brabham BT52! Wow, thanks vtakgeezer! That's quite a compliment; perhaps I should look to you when it comes time to beta test. Well, as you can see, it's coming along fairly well. I'm still throwing around ideas for the rear wing, and trying desperately to figure out how to model the rest of the engine cover and the diffuser, although I most likely will keep the rear wheel fins, as I quite like how they look. 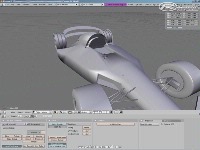 The body seems, to me, only works when I shape the front of the car like a Formula 1/Indy/Champ car, and the back of it in a similar manner with styling of a LeMans Prototype, the linkage on the back of the rear wheel fins will probably have LED lamps fixed to them, as well as being a brace for one of the rear wing fins; in fact, those fins ARE going to be one of the mounting points for the rear wing! And on one last note, I had a rush of ideas on what to do with the cockpit, steering wheel, and instrumentation; so I'll focus on that for the time being. It'll have some very interesting, and futuristic, styling, as well as an LCD screen in the middle of the steering wheel to keep an eye on the car's status, and a small dashboard, with a unique take on RPM LED's, and even a rev needle for that old school touch. Don't reaaly like the look of the car, it looks too much like a plane. I don't really think that the aero is working that well. looks awesome. it kind of reminds of the xb70 valkyrie. i hope you have fun building it and i can't wait to test it out some day. Haha! Funny you mention that, roadhog, because that's exactly what I was going to do! I want two different engine types, a good old "normal" engine putting out a ton of horsepower, and an upgrade option to use a turbine engine. Should be tons of fun!